Blake Ittmann poses with the pending free-diving world record tripletail — a 31.3-pounder, which he shot out of Venice last Wednesday. Blake Ittmann has been free-diving the waters south of Venice for only four years, but in that time he’s become pretty selective in what he shoots. Ittmann and his buddies could absolutely load the boat with tripletail at some of the platforms they frequent now, but there’s not a whole lot of challenge in that. Still, that doesn’t mean the divers avoid the tasty fish, and that was certainly the case on Wednesday. The crew went down hoping to get some meat for the table and maybe a trophy. They succeeded in that latter quest in spades. 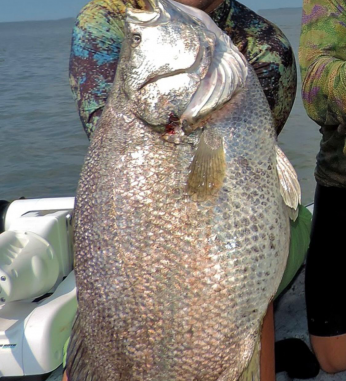 Ittmann shot a 31.3-pound tripletail that is 4 pounds heavier than the current world-record, a fish shot by Lawrence Palmisano in 2015, according to the International Underwater Spearfishing Association. Ittmann said the trophy fish was about 15 feet down, and he swam within 4 feet of it before spearing it. The shot was a clean one, but that didn’t mean the fish came up easily. “It was stuck between two rig legs, so I had to go down a few times to untangle it,” he said. Ittmann knew the fish had record potential, but he wasn’t able to weigh it until Saturday at a seafood market in Metairie. He’s sure the fish lost some weight between Wednesday and Saturday. Ittmann said tripletail are often so thick at the platforms south of Venice, there’s really no challenge in harvesting them. 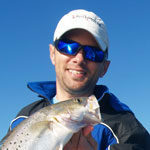 “I don’t go as often as some people do, just because it’s not the most difficult fish to shoot, in my opinion,” he said. “Sometimes they’re off the rig; sometimes they’re in the rig. Ittmann said he holds his breath on most dives for about 80 seconds, although he can push it to 90 seconds on occasion. That doesn’t sound like a lot of time, but the gear he and his fellow divers use helps them accomplish much in those valuable seconds. “The fins are gigantic, so a couple kicks and you’re down where you need to be,” he said. A lifelong angler, Ittmann is attracted to free-diving because it allows him to see what’s going on underwater and observe the fish in their habitat. And some of the fish he observes are sharks. He mitigates that risk by diving only with a group of experienced divers who know what warning signs to look for with their buddies.